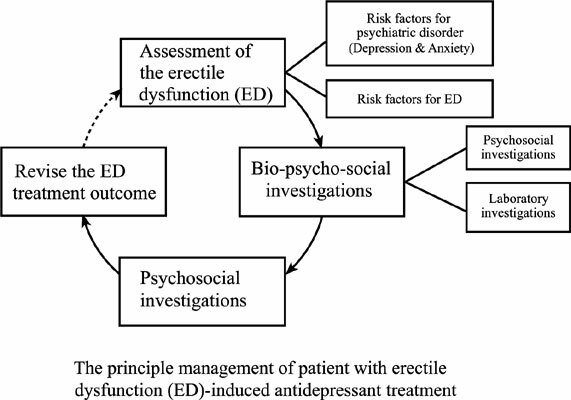 Co-Morbid Erectile Dysfunction (ED) and Antidepressant Treatment in a Patient – A Management Challenge? Throughout the world, antidepressants (AD) and phosphodiesterase-5 inhibitors (PDE-5i) are the commonly prescribed psychopharmacological agents for treating patients with co-morbid mental health problem and sexual dysfunction (SD). The serotonergic and noradrenergic ADs, although effective, are not without any SD adverse-effects, especially erectile dysfunction (ED). ED is a failure to obtain a satisfactory erection for rewarding sexual coitus during the phases of male’s sexual arousal. It is recognized as an important reason why non-adherence to treatment was observed in patients who were on AD. AD intervention caused remission to some of the pre- treatment psychopathology of ED. However, in many patients, AD potentially magnified the unwanted sexual sideeffects. This made the situation challenging for the mental health professional. These challenges are based on the complexity of ED, its etiology and the associated risk factors, which further add to its AD side-effect. The neuro-psychopharmacological basis for AD treatment selection was deliberated. Bio-psycho-social interventions are recommended at two pivotal stages. Firstly, a step should be taken for proper assessment (e.g. detailed history, psychosocial and laboratory investigations); and identify few modifiable risk factors for ED and associated mental health issues. Secondly, with guidance of an algorithm pathway, a practical intervention should include strategies such as dose reduction, augmentation or changing to an AD with lesser or no sexual adverse-effects. It is recommended that bupropion and mirtazepine to be prescribed when patients develop adverse sexual effects with serotonin selective reuptake inhibitor (SSRI), serotonin norepinephrine reuptake inhibitor (SNRI) and tricyclic antidepressant (TCA). Few suggestions which may be borne in mind are revising sexual scripts and improving sexual techniques, life-style modifications, psychotherapy and other nonpharmacological approaches which may be beneficial to both patients and their partners. Antidepressants, phosphodiesterase type 5 inhibitors (PDE-5), erectile dysfunction (ED).